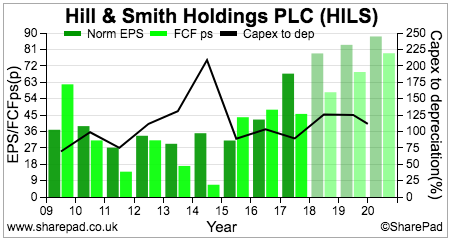 Shares in Hill & Smith Holdings (LSE:HILS) have been a very solid investment in recent years. The company’s strategy of focusing on niche infrastructure markets with significant regulation and health and safety characteristics has seen its businesses grow and become increasingly profitable. Total returns to shareholders have increased by 258% over the last five years. This has been helped by a decentralised management process that encourages the company’s managers to run their businesses in an entrepreneurial way as well as a focus on delivering higher profit margins and returns on capital employed (ROCE). The bulk of the revenues and profits are earned in the UK but the company has been building up its roads business overseas in the USA, Australia, New Zealand and Scandinavia. This business has been growing nicely with rising profit margins. It has benefitted from the UK government’s spending on upgrading the UK motorway network and the creation of smart motorways which will have received £15bn of money between 2015 and 2020. This has seen buoyant demand for the rental of the company’s temporary safety barriers. The outlook for this part of the business looks to be very favourable over the next few years. Despite the current investment in the UK road network, there is still a lot of work to do in order to deal with increasing levels of road congestion. Should this funding materialise then it’s difficult not to see it as being very favourable for Hill & Smith as it should allow it to keep on growing its revenues and profits from UK roads. Combine this with the prospects for steady growth from new overseas roads projects and the recent acquisition in the USA and there is a lot to like about this business in my opinion. Engineered pipe supports for natural gas, power networks, wastewater and petrochemical applications. Industrial products made from steel and composite materials used in railway platforms, train depots, wind farms and oil and gas platforms and cooling towers. Security barriers to protect infrastructure such as power stations, data centres and stadiums. Building products such as composite doors and steel lintels used in new houses. This business is not as profitable as roads and does have a tendency to have quite lumpy revenues and profits depending on the scheduling of work by its customers. As with roads, this business is supported by the fact that there is a sizeable and growing amount of ageing infrastructure in developed economies such as the USA and the UK that needs to be replaced and upgraded. In the UK there is the prospect of large amounts of money being spent on the railways with projects such as HS2 and the replacement and repair of railway bridges. Water companies have a backlog of spending to complete in their current five-year regulatory contracts whilst a buoyant new build housing market is supporting demand for building products. Demand for security protection products is expected to grow across the world. In the Middle East, the company’s Bristorm perimeter barriers are being used to protect power, desalination plants and petrochemical facilities. The US government is also committed to spending lots of money on upgrading infrastructure such as bridges and electricity networks. This is the company’s most profitable business. It has a sizeable presence in the USA where it is the market leader as well as significant businesses in the UK and France. The business uses processes such as hot dip galvanizing which involves coating iron and steel products with molten zinc in order to protect against corrosion and help create durable products. It also uses powder coating finishes on metalwork such as fencing, gates and structural steelwork in order to create a long-lasting product that requires low levels of on-going maintenance. These galvanising products are used extensively in areas such as roads, construction, utilities and transportation. The business also fits very well with its infrastructure activities as its products such as road barriers provide a lot of demand for the galvanising business. 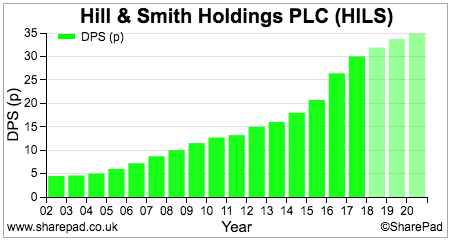 Profits have grown significantly at this business in recent years and profit margins are very high. Margins fell slightly last year due to the rising price of zinc which increased costs. Going forward, the commitment to increase spending on infrastructure bodes well for the core US and UK galvanizing businesses. France has been more patchy but growth did pick up in the second half of last year. Whilst it does not have the hallmarks of a truly outstanding business, Hill & Smith ticks a lot of boxes in terms of the quality of its financial performance. 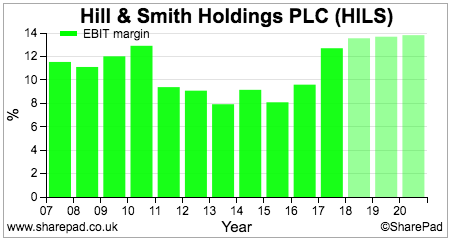 Its profit margins are pretty decent and are expecting to keep on rising. ROCE is now at a very good level. Given that ROCE makes up 25% of management bonus targets, they are incentivised to keep returns high and invest the company’s money wisely. If we look at the company’s target margins in the table below, we can see that there may be scope for improvements in infrastructure margins but less so in Galvanizing. Rising margins in infrastructure should give the company a decent chance of at least maintaining current levels of ROCE, once recent acquisition spending has been taken into account. The conversion of post-tax profits (or EPS) into free cash flow is reasonable and has been improving in recent years. Capital expenditure is not much higher than depreciation and is therefore not a major drag on free cash flow. The company does have reasonable working capital commitments which will reduce cash flows when the business is growing. Stock building is required in advance of new orders for infrastructure products whilst the price of zinc can have an impact on inventory levels at the galvanizing business as it did in 2017. 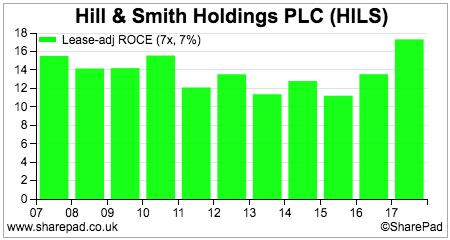 Debtor days have been stable at 61 days for the last couple of years. The increase in the cost of zinc in 2017 saw the working capital to sales ratio increase. Debt levels remain very comfortable. 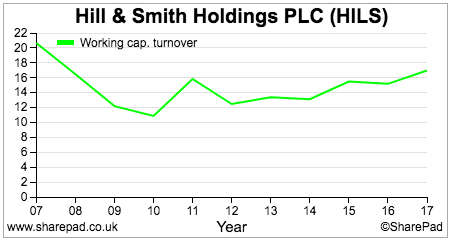 Net debt to EBITDA including the small pension fund deficit is just over 1.2 times and is forecast to fall rapidly over the next three years. This will give the company plenty of firepower to make more acquisitions. Fixed charge cover – the number of times operating profits cover interest and rent payments – was 7.5 times in 2017 and provides further evidence of the company’s strong financial position. Hill & Smith has a very commendable track record of increasing dividends and has done so for the last 15 years. 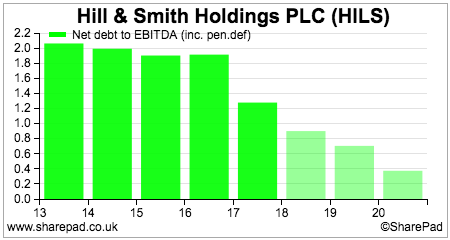 City analysts expect dividends to keep on increasing whilst dividend cover is expected to remain very comfortable at around 2.5 times. Management have done a very decent job in achieving these results but they are paid very generously – arguably too much in my opinion. Excluding a very substantial long-term bonus award, the CEO took home £1.1 million in 2017 which included a substantial payment in lieu of a pension contribution. He does have a decent shareholding in the business which is good to see. The finance director only just met the shareholding guidelines of 200% of annual salary at the end of 2017 and recently sold most of the shares awarded to him from the long-term incentive plan. Despite a slow start to the year due to bad weather holding back road projects in the UK, the company is due to deliver steady growth in profits over the next few years. 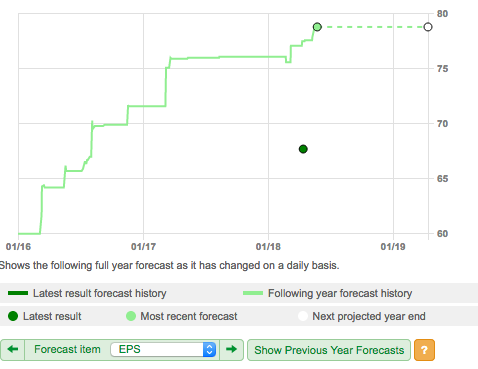 Consensus EPS forecasts for 2018 had been moving higher but I do not expect this to continue given the company’s recent trading statement which said that a pickup in trading in the second half of the year would offset the weather related slow start in the first half. 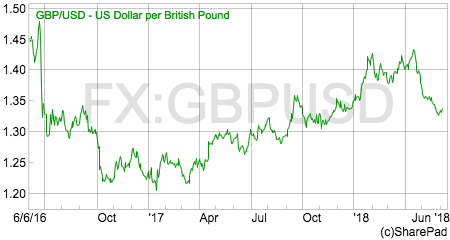 One thing to keep an eye on is the £/US$ exchange rate. Each one cent move in the dollar moves operating profits by around £0.28m. The weaker pound had been helpful to profits in 2017 but had expected to be a headwind in 2018 as the pound strengthened. The recent weakening of the pound against the dollar may give more support to current forecasts and even lead to upgrades if it is sustained. It would not surprise me if the company made further acquisitions in addition to its recent $42m purchase of a US road infrastructure products business. It has clearly stated that it wishes to expand its geographic footprint and move into complementary infrastructure products such as composites. I think this company is in a good place right now and should remain so as long as governments remain committed to spending more money on infrastructure which looks to be urgently required. The high levels of regulation and health and safety requirements of its products mean that it is not easy for new competitors to enter its markets and compete away its profitability. 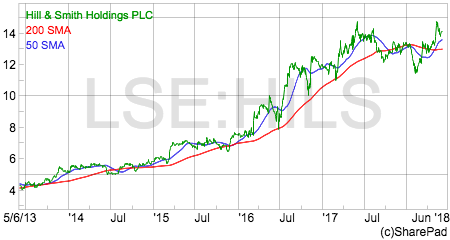 The shares are not particularly cheap and trade on a one year forecast rolling PE of 17.5 times at a share price of 1416p. 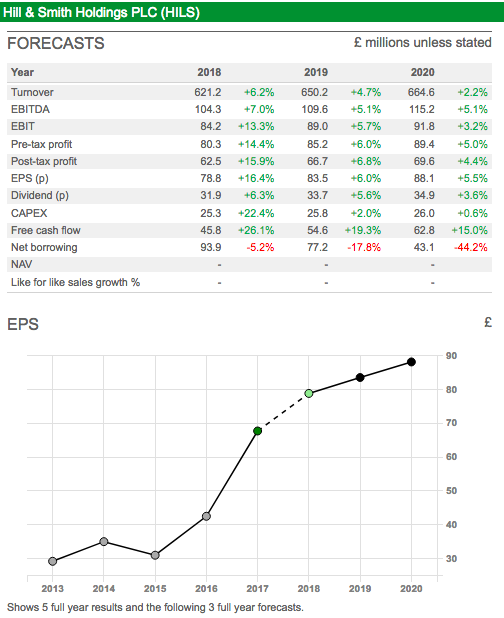 That said, this is a company that looks to have a very dependable, defensive and growing profit and cash flow stream that could suggest that its valuation is not yet excessive.